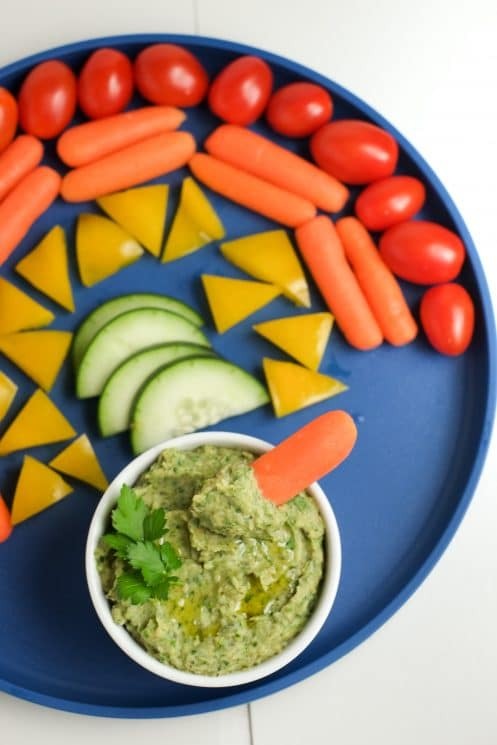 A simple veggie dip perfect for St. Patrick’s Day – or any day. 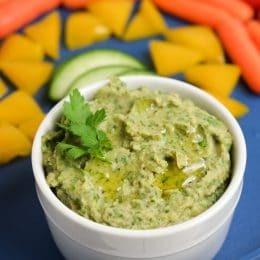 Mild and delicious green hummus without tahini, but WITH spinach and cheese! 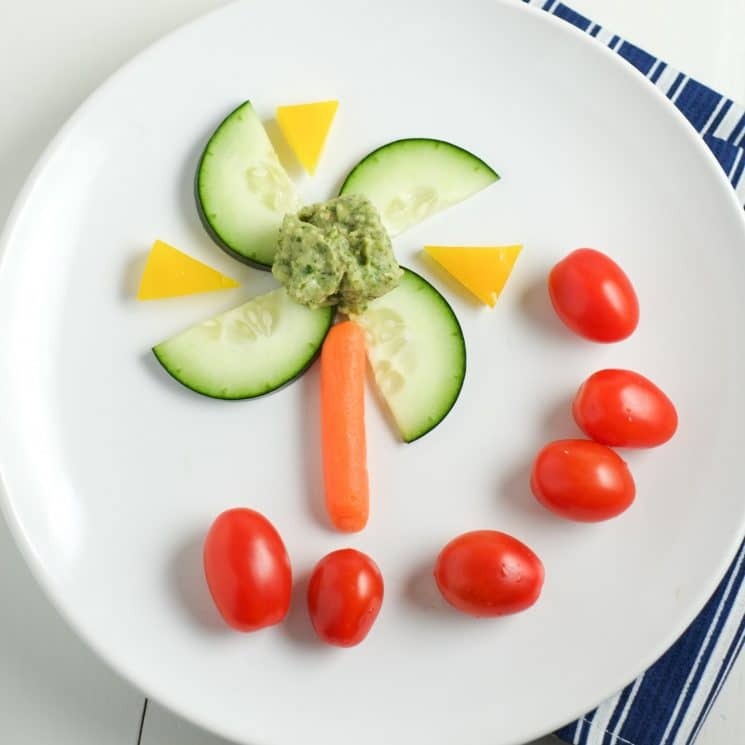 With St. Patrick’s Day right around the corner we wanted to come up with a healthy snack for the holiday. 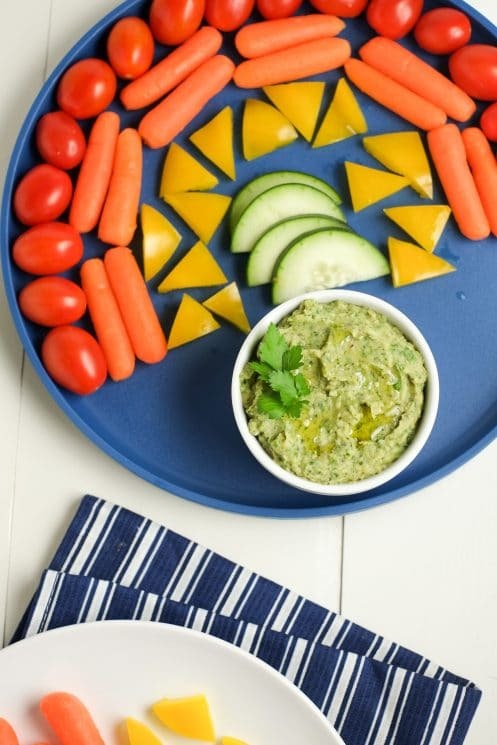 Green hummus is the perfect snack because it’s festive and good for you. We love hummus, but sometimes the flavors are a little strong for kiddos. 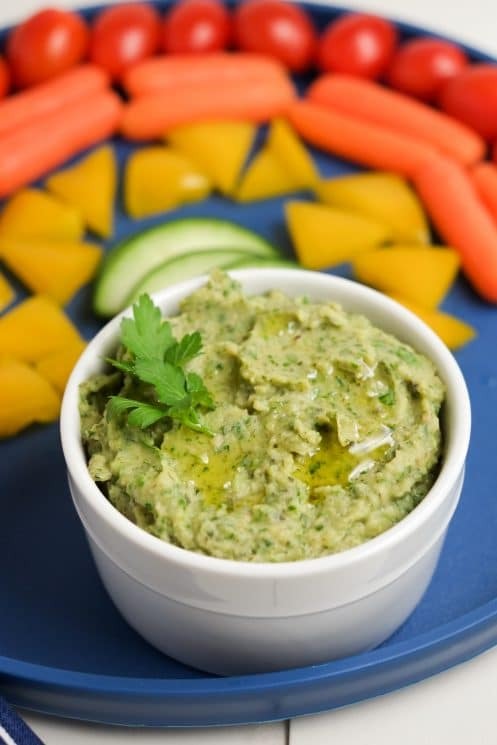 This hummus is designed to be mild enough for picky eaters to help them get their veggies down. Plus, it is veggies! I used great northern beans for this hummus for something a little different. Great northern beans make the hummus a little smoother because they are softer beans (but garbanzo beans work too, if you prefer them). Great northern beans are indeed great – they’re high in protein, folate, and fiber. They’re also particularly high in all sorts of minerals: iron, magnesium, manganese, potassium, copper, and selenium. Talk about a super food! I also added a cup of spinach, and we all know that stuff is fantastic. 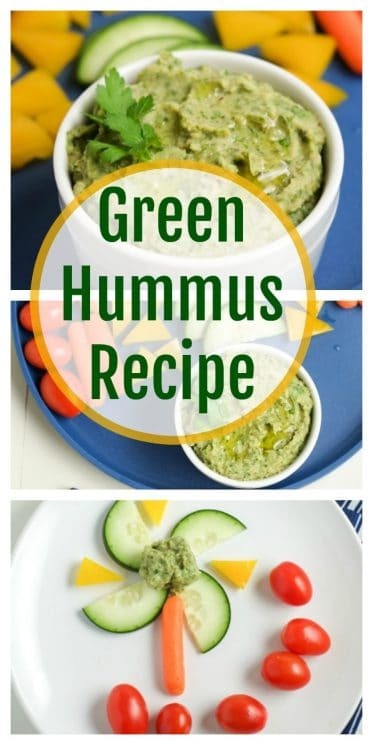 It also makes the hummus green! Another green component is avocado, which adds a nice creaminess and adds healthy fats. We used this instead of tahini and oil, so it’s milder but creamier and lower in calories. 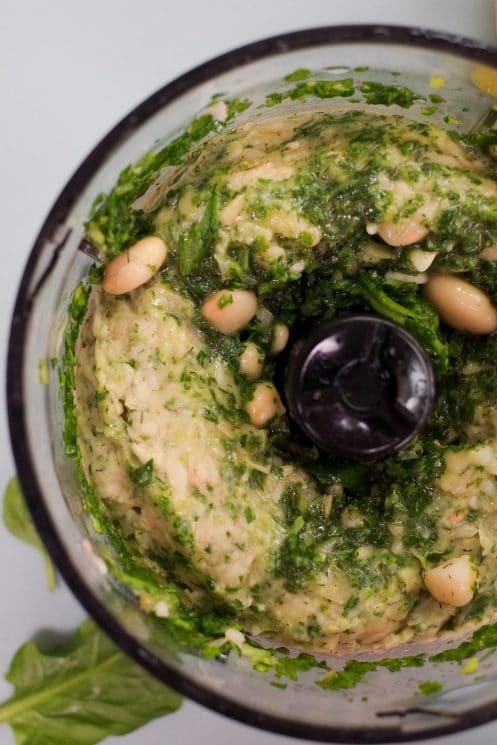 All you really need to make hummus is a food processor or high-speed blender. 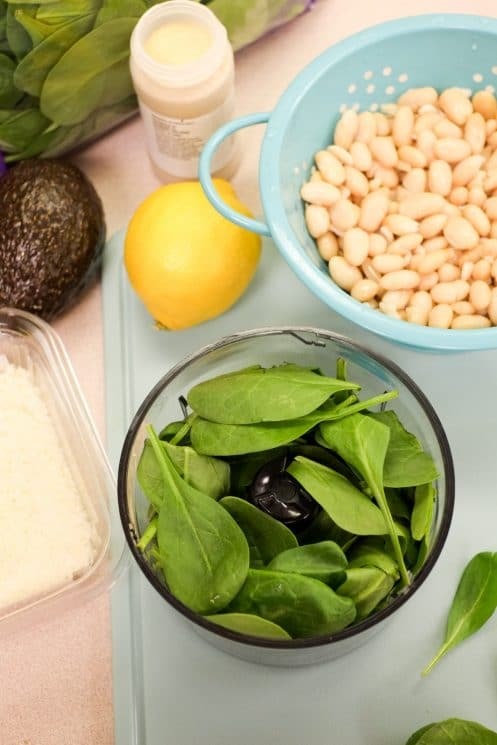 Since this recipe calls for softer beans it’s easier to blend up than traditional hummus, with help from the avocado. I recommend first blending up the spinach to cut down on volume. I used one cup, but I’m sure you could sneak in two! Once that’s been pureed pretty well, add half an avocado, parmesan cheese, garlic, salt, and lemon juice. I used half a fresh lemon – about 1.5 tablespoons. Pulse that up. Finally, rinse and drain a can of great northern beans. Add them to the food processor and pulse. You may need to scrape the edges down a little and keep pulsing. If for some reason your hummus isn’t processing, add a small amount of the leftover bean liquid or water. Refrigerate for at least an hour or two, if possible. 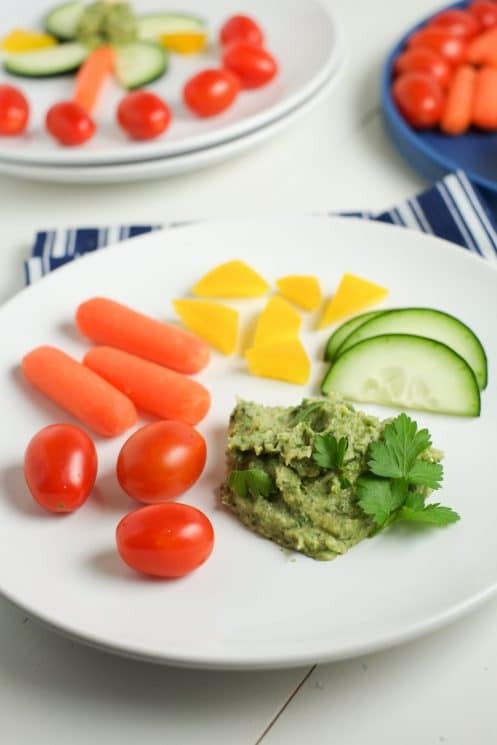 Serve with a rainbow of veggies or some healthy crackers. In a food processor, pulse spinach until mostly pureed. Add avocado, parmesan, garlic, salt, and lemon juice. Pulse until combined and pureed. Rinse and drain 1 can of great northern beans. Add to the food processor and pulse until the entire mixture is well pureed, scraping the sides as needed. Add a little extra liquid from the can or water if necessary. How many servings does this recipe make. I do so appreciated the nutrition per serving that you give along with the recipe. I just do not see the number of servings the recipe makes.